They are an understandably popular dive and photography choice and you can dive with them at a variety of top liveaboard diving destinations. 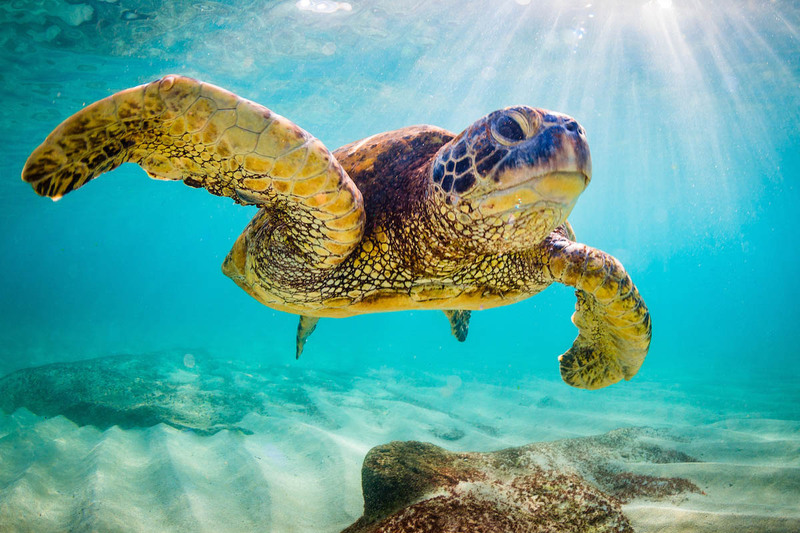 Six of the seven species of sea turtle can be seen at the Great Barrier Reef, where they feed and nest. The best way to go turtle spotting is during a Great Barrier Reef liveaboard cruise to the outer reef, where you’ll typically dive Ribbon and Osprey reefs. Both of these stunning reefs are great places to see green, hawksbill and loggerhead sea turtles. Keep your eyes open for the less commonly seen Olive Ridley and leatherback sea turtles as well. The Galapagos green sea turtle is the only type of green sea turtle that nests on the beaches of the Galapagos Islands. These turtles have a slightly darker and more domed shell than green sea turtles and can be seen when Galapagos liveaboard diving. Cabo Marshall and Cabo Douglas are both good dive sites for sea turtle sightings and there are plenty of other marine life highlights to enjoy at this world-class dive destination. The Similan Islands are home to some of the best dive sites in Thailand and include thriving reefs, submerged boulders and stunning rock formations. This is a great destination to encounter green sea turtles whilst also enjoying marine life such as whale sharks, manta rays and more. The Surin Islands are less accessible and, as such, are a sought after liveaboard diving destination. The healthy reefs at these islands have huge numbers of green and hawksbill turtles. Oman liveaboard diving is a great way to experience this turtle hotspot and relatively new dive destination. Oman is visited by Hawksbill and green sea turtles and the Daymaniyat and Hallaniyat Islands are well known for their nesting sea turtle populations. The Musandam Peninsula also has sea turtles at the coral reefs found there. May and June are the months to visit to see hawksbill and green sea turtles nesting on island beaches. There are more great destinations to go swimming with sea turtles, including Malaysia and the Maldives. Find out all about them in The Top 5 Places to Dive with Sea Turtles.